A hairpin is an implement for securing a hairstyle and/or decorating the hair. 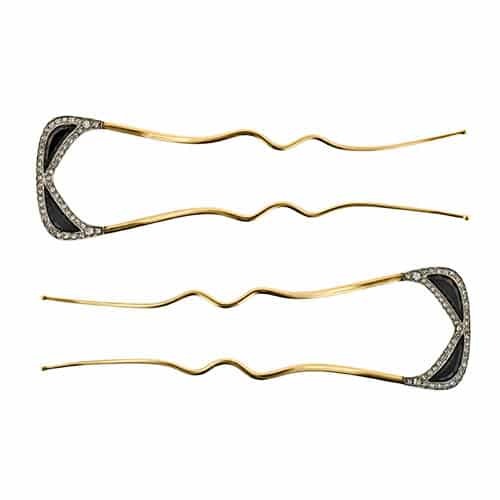 There are two pronged hairpins which are usually “U” shaped with parallel and equal sides. These are pushed into the hair to help secure the styling and can have a decorative element or pendant. Single prong “stick-like” hairpins generally have a decorative knob or ornament at one end atop a spear-like stick that pokes through a hairstyle providing ornament and security. Edwardian Diamond and Onyx Hairpins, c. 1900.